Although several papers were dealing with intensively reared broodstocks, most of the published artificial reproduction protocols were applied in wild pikeperch breeders. Therefore, we aimed to evaluate the effects of ovulation induction agents, namely human chorionic gonadotropin (hCG) and salmon gonadotropin–releasing hormone analogue (sGnRHa) on the reproductive performance in pre-seasonal artificial propagation of cultured pikeperch. Breeders were harvested from an outdoor in-pond circulation system in mid-September and transferred to indoor facility in late January, conditioned and injected with either 50 μg kg−1 of sGnRHa or 500 IU kg−1 of hCG, with six females in each hormonal group. Stripped eggs from each female were sampled for chemical composition analysis, fertilised with the milt of two males, incubated and obtained larvae were further reared. No significant differences were noticed between the treatments in any of the analysed parameters of embryo survival nor larviculture performance. Rather high differences in intragroup variation were seen between the treatments, expressed in several-fold higher coefficients of variation in embryo survival in experimental and commercial conditions in the hCG group. Eggs obtained from females treated with hCG had a significantly higher lipid content (31.1% ± 2.0%) compared to sGnRHa-treated females (27.4% ± 1.8%). Fatty acid profiles of the eggs revealed differences in total n − 6 and linoleic acid 18:2n − 6 content while n − 3/n − 6 was significantly lower in the hCG group. Gonadoliberins reduced the variability in the spawning outcome. It appears that hormones can modify the eggs’ fat content during the pre-season artificial reproduction. The issue of producing pikeperch (Sander lucioperca L.) juveniles suitable for intensive on-growing has gained considerable research attention during the last two decades (Zakęś and Demska-Zakęś 1996; Kestemont et al. 2007; Ljubobratović et al. 2017a). Nevertheless, spawning induction of these fish after the grow-out phase has been the subject of a handful of studies thus far (Hermelink et al. 2013, 2017; Zakęś et al. 2013). 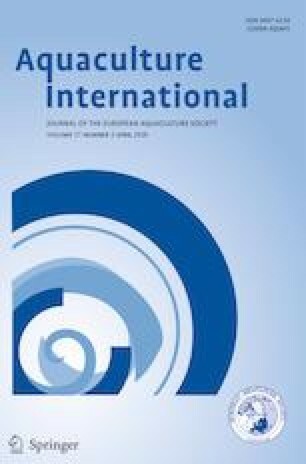 These studies focused on the usage of recirculation aquaculture systems (RASs) for this task with a single study dedicated towards pond wintering of cultured breeders (Ljubobratović et al. 2017b). This study found outdoor spawning induction to be an economically attractive and technologically feasible alternative to producing larvae seasonally. On the other hand, the production of stocking material for intensive on-growing requires an out-of-season supply of larvae, which is the main disadvantage of broodstock wintering in outdoor conditions that allows single seasonal reproduction. However, previous studies have shown that such induced pikeperch breeders could be propagated already in early winter with rather satisfying results in the main parameters of reproductive performance (Zakęś and Szczepkowski 2004; Ronyai 2007; Müller-Belecke and Zienert 2008). These early studies described egg quality parameters in terms of embryo survival and hatching only. Although the quality of the egg is defined as its competence to develop into a proper embryo (Bobe and Labbé 2010), recent studies found it crucial to incorporate additional parameters for more accurate evaluation of the quality of gametes in percids (reviewed by Schaerlinger and Żarski 2015). Under natural conditions, developmental phase in oocytes characterised by a dramatic increase in their size - the vitellogenesis or secondary growth, happens mainly during autumn in pikeperch. Within this period, a decrease in water temperature, photoperiod and light intensity triggers the hypothalamus to secrete gonadoliberins (gonadotropin-releasing hormones (GnRHs)), which induces the secretion of gonadotropins (GtHs) in the pituitary. Consequently, the vitellogenin is transported from the liver to the oocyte resulting in oocyte growth (Reading and Sullivan 2011). Based on the reports for pikeperch and walleye (Sander vitreus), most of the oocyte growth is completed by late December (Malison et al. 1998; Fontaine et al. 2015). Nevertheless, the natural spawning season in pikeperch occurs during spring (Schlumberger and Proteau 1996; Lappalainen et al. 2003). Thus, the final oocyte maturation (FOM) phase seemingly happens during this period, triggered by a substantial increase in temperature, photoperiod and light intensity (Müller-Belecke and Zienert 2008; Żarski et al. 2012a). Such a rather long period of stable oocyte size during winter indicates the two-phase maturation process in pikeperch (Patiño et al. 2001). Considering that artificial reproduction in female fish basically involves the induction of FOM and ultimately ovulation (Żarski et al. 2015), this nature of oocyte maturation in pikeperch was exploited to induce spawning by as much as a whole winter season earlier (Ronyai 2007). Artificial induction of FOM in such case is carried out by the means of exogenous hormones, either GtHs or GnRHs (Mylonas et al. 2010). Similar to the vitellogenesis phase, maturation is controlled by the hypothalamus–pituitary–gonad (HPG) axis (Nagahama 1994; Donaldson 1996). In the case of FOM induction with hormones, either the pituitary or gonads are targeted, which is determined by the selection of a hormonal agent. Gonadoliberins trigger the secretion of GtHs on the pituitary level (Habibi et al. 1989), while GtHs affect the secretion of steroids in the gonads (Swanson et al. 2003). Gonadotropins are mainly present in two forms, follicle-stimulating hormone (FSH) and luteinizing hormone (LH), whereas, in total, eight molecular forms of GnRHs have been isolated from the various teleost species and many of those are today synthesised as analogues (Somoza et al. 2002). The activity of these different analogues varies among the species and with this the efficacy of GtH release (Habibi et al. 1989). Earlier studies on pikeperch used mammalian analogues (mGnRHa), with (Zakęś and Demska-Zakęś 2005; Rónyai 2007) or without (Křišt’an et al. 2013) the dopamine inhibitor and found this preparation inferior to the human chorionic gonadotropin (hCG). Nevertheless, a recent study on out-of-season reproduction performance which used a salmon gonadotropin–releasing hormone analogue (sGnRHa) found no differences between these preparations (Żarski et al. 2019). Instead of spring, the pre-seasonal artificial reproduction takes place during winter and implies that FOM did not start prior to the application of hormones, but it also needs to be initiated by them. Thus, targeting the pituitary rather than the gonads, i.e. by interfering with hypothalamic hormones, could hypothetically be advantageous in percids (Żarski et al. 2017). Evaluation of the propagation success in fish is a rather demanding task. Individual organisms are used as the units of replication, yet the number of eggs per individual female is usually counted in the thousands leaving a large space for individual variability. In the case of young and reproductively unexperienced cultured pikeperch breeders, this problem was indeed described (Zakęś et al. 2013; Ljubobratović et al. 2017b; Żarski et al. 2019). Therefore, in order to evaluate the reproductive performance of fish, it is of major importance to evaluate a wide spectrum of parameters. Likewise, for describing the quality of obtained gametes, it is desirable to follow their development through embryonic and larval stages in order to present a conclusive description of their performance. A few studies on percids have followed reproductive success from many different angles (Castets et al. 2012; Ben Khemis et al. 2014; Schaefer et al. 2018). In terms of interrupted oocyte development, and possibly incomplete fat transportation, the proximal composition and fatty acid (FA) profile could be interesting and informative parameters. Indeed, in the case of the Eurasian perch (Perca fluviatilis), it was found that hormones may modify FA profiles during pre-season propagation; this is not the case during natural spawning season (Żarski et al. 2017). Finally, several studies have even dealt with the larval phase (Dabrowski et al. 2000; Żarski et al. 2011) and it has been confirmed that larval performance in intensive conditions is a rather informative parameter for describing the quality of obtained stocking material in pikeperch (Ljubobratović et al. 2017b, 2018a). Acting earlier on the HPG axis and thus leading to a wider physiological response, GnRHs are a hypothetically more suitable agent for FOM induction in pre-seasonally injected pikeperch. Therefore, the aim of the present study was to evaluate the success of pre-season artificial reproduction in intensively cultured pikeperch breeders with respect to the type of hormonal preparation: either hCG or a sGnRHa. In order to observe the consequences of disrupted oogenesis, proximate and FA compositions were analysed in stripped eggs. Finally, to assess the effect of hormonal preparation on the larval quality as well as to evaluate the aptness of pre-seasonally obtained stocking material for intensive rearing, the success of larviculture was followed. The broodstock used in this study hatched in April 2013 by the artificial reproduction of wild pikeperch breeders originating from an oxbow of the river Körös. Larvae were nursed in ponds, and 5-week-old juveniles were transferred to the RAS where habituation to dry feed was carried out. Since then, the fish were kept in intensive rearing conditions. The breeders were artificially propagated for the first time in mid-February 2016. From May 2016, the temperature was kept constantly at 22–24 °C with a continuous light intensity on the water surface of around 1 lux. In mid-September 2016, 64 breeders in total (mean individual weight of 1.3 kg ± 0.2 kg) were transferred to the outside in-pond circulation system (IPCS) tank (total volume 8 m3). The broodstock diet used for the last on-growing period was Coppens Repro (Coppens International, Netherlands; based on the producer’s declaration the diet contains protein [48%], fat [15%], crude fibre [0.7%], ash [9.9%] and total P [1.48%]). In early November 2016, the IPCS tank was stocked with live prey fish of individual with a total length of 5–15 cm, originating from the oxbow of the river Körös and consisting of bleaks (Alburnus alburnus), rudds (Scardinius erythrophthalmus), roaches (Rutilus rutilus), breams (Abramis brama) and common carps (Cyprinus carpio). In total, the biomass of stocked prey fish was 50% of the total pikeperch biomass, making the total biomass of the tank about 120 kg. Feeding with live prey was done in order to ensure the optimal nutrition for the breeders as the optimal dry feed composition for pikeperch had not been defined thus far. After being stocked in the IPCS, fish were exposed to natural photo-thermal conditions with the purpose of induction of gametogenesis. In January 26, a total of 12 females (mean individual weight 1.4 kg ± 0.2 kg) and 12 males (mean individual weight 1.4 kg ± 0.1 kg) were transported into the inside RAS at an outside water temperature of 1.6 °C and a light:dark (L:D) photoperiod of 9 h:15 h. After this, water was gradually heated for 2 °C per day until 12 °C, which was kept as the constant temperature from then on. From the point when the fish were transported to the RAS, the photoperiod was kept at the 12-h:12-h L:D photoperiod. Eleven days after the transportation, all fish were hormonally treated. Six females were treated with sGnRHa [d-Arg6,Trp7,Leu8,Pro9-NEt]-GnRH (Ova-RH; Syndel Laboratories Ltd., Canada) in a total dose of 50 μg kg−1. The remaining six females were injected with hCG (Choragon, Ferring International Center S.A., Switzerland) in a total amount of 500 IU kg−1. Like this, two groups were formed—sGnRHa and hCG—each consisting of six females. The applied hormonal doses are in line with recommendations for the intensively reared pikeperch (Żarski et al. 2019). All males received hCG in amounts of 250 IU kg−1. 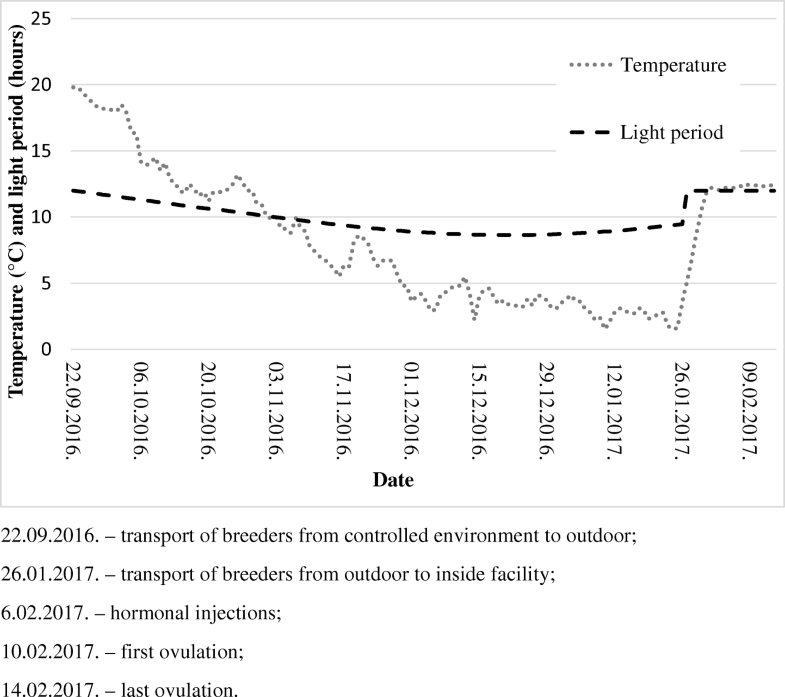 The full protocol used for induction of spawning since the breeders were moved outside is presented in Fig. 1. In order to evaluate the fertilisation rate and embryo survival in experimental conditions, straight after the collection of gametes, a sample of 200–300 dry eggs was taken by spoon and 50 μL of sperm was taken by the Eppendorf pipette and added to the dry eggs. Finally, merged gametes were activated in a 20-mL Petri dish filled with plain hatchery water. After the egg swelling was completed (45 min post-fertilisation), the Petri dish was dipped into the hatchery water and placed in a 0.5-L plastic bowl which remained at a constant temperature of 12 °C. Seventy-two hours post-fertilisation, the embryo survival was assessed for the eggs by counting both live and dead eggs. Further on, at the eyed-egg stage (10 days post-fertilisation), pre-hatch survival was estimated in the jars as the ratio of live embryos to the total number of previously counted eggs. The Zug jar incubation set was supplied with aerated and well-oxygenated water in a flow-through system. Water temperature and the oxygen saturation of the outflow water were monitored every 12 h. Mean water temperature during incubation was 14.6 °C ± 0.5 °C (range 13.8–15.5 °C), while mean oxygen saturation was 103.7% ± 8.9% (range 92–117%). After the propagation, breeders were kept in the RAS for ten additional days. Thereafter, breeders were transferred back to the IPCS. Broodstock mortality was monitored during RAS rearing as well as following restocking into the IPCS for two more months. Ninety-six hours post-fertilisation, the number of live eggs (embryos) per unit of volume was calculated for every Zug jar. Twenty millilitres of eggs from each jar was sucked into the 25-mL pipette, and after settling, 2 mL of eggs were gently placed in the Petri dish and the live eggs were counted. This procedure was repeated three times for each replicate in both treatments. Based on the mean number of three samplings, the number of eggs per millilitre was evaluated for each replication. From that point onwards, water in the Zug jars was maintained in terms of oxygen oversaturation in order to prevent premature hatching of larvae. Thus, once the eye pigmentation occurred, a sample of 12,500 eggs was taken out from the jar by the 25-mL pipette and stocked in a 4-L bowl supplied with 1 L of hatchery water. The bowl was transported to the larval rearing RAS where the eggs were hatched and larvae released to their respective tanks; i.e. eggs from each mother were stocked in a separate tank. Larval rearing tanks are cylindroconical in shape, with a white conical bottom and black cylinder-shaped walls. Tanks are enabled with two types of flow, up-welling and circular. In that sense, from hatching until the completion of swim bladder inflation, 1–15 days post-hatch (DPH), larvae were kept in an up-welling flow. During this period, newly hatched Artemia nauplii were the only food type supplied to larvae. Starting from 5 DPH, daily amounts of Artemia nauplii were 100 nauplii egg−1 day−1 and were gradually increased to 300 nauplii egg−1 day−1 on 15 DPH. During the first 3 days of exogenous feeding, larvae were fed with Artemia franciscana nauplii (AF origin; INVE, Dendermonde, Belgium). Further on, Artemia salina (GSL origin; INVE, Dendermonde, Belgium) were used. Overflow-type outflow was secured with an outflow box and changeable screens with a mesh eye size of 400 μm. From 16 DPH onwards, flow type was changed to circular with standpipe inserted as the outflow. Around the standpipe, the screen pipe protected larvae from exiting the tank with a mesh eye size of 850 μm. The weaning process was initiated on the same day that the flow type was changed. Between 16 and 20 DPH, the daily amount of Artemia nauplii was gradually reduced by 20% and was totally excluded from the diet at 21 DPH. The daily amount of given dry feed was 20 g tank−1 day−1 on 16 DPH and was gradually increased with fish growth to 80 g tank−1 day−1 by 30 DPH. Otohime larval feeds (Marubeni Nisshin Feed Co. Japan) were used during the trial. During weaning, the B1 grade (pellet size 250–360 μm) was used, while the B2 (pellet size 360–640 μm) and C1 (pellet size 580–840 μm) grades were used from 21 to 25 DPH and from 26 to 30 DPH, respectively. Artemia nauplii were continuously supplied by hand every 4 h in equal daily batches while the dry feed was offered by a belt feeder (4305 FIAP belt feeder; Aquacultur Fishtechnik, Germany) which was loaded twice per day, every 10 h. In order to promote swim bladder inflation, the water surface of each tank was cleaned using a surface sprayer with a flat fan nozzle. Tank hygiene was maintained by extracting the uneaten food, faeces and dead fish through the 0.2-L cleaning cup positioned at the cylinder bottom. Tank walls were cleaned twice per week with a sponge and salt. From hatching until 15 DPH, larvae were reared under a 14-h:10-h L:D photoperiod. During the light period, the light intensity on the water surface was 5–8 lux, while during the dark period, the light intensity was reduced to 1 lux. From 16 DPH onwards, larvae were reared under constant light, with 10–20 lux intensity on the water surface. During the up-welling flow period, flow was gradually increased from an initial 30% to a final 75% water exchange rate per h. During the circular flow, the water exchange rate per hour ranged from an initial 75% to a final 150% by the end of the trial. Water temperature and oxygen saturation were measured daily, while the rest of the water quality parameters were measured twice per week at the collecting tank of the outflow water from all tanks. Thus, the mean water temperature was 17.2 °C ± 1.1 °C and the mean water oxygen saturation was 98.6% ± 4.4%. The means of other water quality parameters were as follows: ammonium nitrogen (0.16 mg L−1 ± 0.07 mg L−1), nitrite nitrogen (0.10 mg L−1 ± 0.07 mg L−1), nitrate nitrogen (24.8 mg L−1 ± 10.2 mg L−1) and pH 8.5 ± 0.2. On 31 DPH, all fish were harvested from each tank. Juveniles were put in a solution of 0.2 mL L−1 phenoxyethanol and 10 g L−1 of kitchen salt, and fish were counted and graded in terms of whether the swim bladder was inflated or non-inflated. In the sample of 30 fish with inflated swim bladders from each tank, individual fish weight and length were measured; the occurrence of spine and jaw deformities was evaluated macroscopically. Five grams of freshly stripped dry eggs were taken from all females, put into separate vials (one vial for each female) and stored at − 20 °C. The chemical composition of the eggs was determined by standard methods of AOAC (1995), mainly by the water and crude protein content of the eggs. Crude protein (CP) was determined by the Kjeldahl method, using digestion block (KJELDATHERM, Gerhardt, Germany) via a distillation procedure (VAPODEST 30, Gerhardt, Germany), and the CP was calculated as N × 6.25. The total lipids were determined from the fatty acid measurements analysed by capillary gas chromatography. Lipids were extracted from the samples with a 2:1 mixture of chloroform and methanol. The extracts were purified according to the method by Folch et al. (1957). Aliquots of total lipid samples were trans-esterified using a methanolic solution of HCl (Stoffel et al. 1959). Fatty acid methyl esters (FAMEs) were separated on fused silica capillary columns (DB-225; Agilent) in an Agilent (HP) gas chromatograph system (type “6890N”) equipped with a flame ionisation detector (FID) and a mass spectrometer detector (MSD) (type “5973N”). The FAMEs were identified using authentic primary (Supelco, Bellefonte, NJ, USA) or secondary (e.g. linseed oil, cod liver oil) standards and by means of the relationship between the logarithms of relative retention times and the carbon number (Cn) of fatty acids. Fatty acid concentrations are expressed as a weight percentage of FA sample, as assessed by the relative response factor (RRF) and molar concentration of FAME (Ackman and Sipos 1964a, 1964b). Total lipids were calculated by summing the milligram per gram values of the present fatty acids in the samples. Data are presented as mean ± standard deviation (SD). Prior to analysis, all percentage variables were arcsine transformed. Further on, data distribution was analysed with the Kolmogorov–Smirnov test and equality of variances with Levene’s test. In case that variable was normally distributed and with equal variances, the differences between the groups were analysed with one-way ANOVA, while in other cases, non-parametric Mann–Whitney U test was used. The significance level was set to a p value ≤ 0.05. In order to better describe the intragroup variation among the parameters of reproductive performance, the coefficient of variation was additionally assessed. The coefficient of variation was calculated as the ratio between the mean and SD within the group. Analyses were performed using SPSS 22.0 software (IBM, New York, NY, USA). All treated females ovulated after hormonal induction. No significant differences were found in any of the analysed parameters (Table 1). However, differences were seen in some of the parameters in terms of their intragroup variability. First of all, latency time was more variable in the sGnRHa group; thus, the timeframe between the first and last ovulation in the group was 92 h, while in the hCG group, it took 29 h for all females to ovulate. Conversely, while the commercial survival and pre-hatch survival in the sGnRHa group was rather stable at 50.2% to 79.3% (individually 50.2%, 59.0%, 59.7%, 69.5%, 77.9% and 79.3%) and 75.6% to 94.4% (individually 75.6%, 79.8l%, 84.8%, 86.2%, 86.3% and 94.4%), respectively, in the hCG, these parameters showed high variability, being in the range of 0% to 69.8% (individually 0.0%, 0.0%, 60.0%, 42.3%, 48.4% and 69.8%) and 0% to 91.3% (individually 0.0%, 0.0%, 33.6%, 76.0%, 78.6% and 91.3%) for commercial and pre-hatch survival, respectively. There was no mortality in breeders while they were kept in the RAS. After transport back to the IPCS, two females died in each group 1 week to 2 weeks post-transport. Due to no commercial survival in eggs from two females in the hCG group, this group was analysed in four replications only. Production efficacy ranged from 22.9 to 31.5% in the hCG group, while in sGnRHa, this parameter was stretched from 19.7 to 37.9%. Although a higher occurrence of spinal deformities was found in the sGnRHa group, there were no statistically significant differences in any of the assessed parameters between the two groups of larvae (Table 2). In that sense, in the hCG group, spinal deformity ranged from 0 to 13.3%, while in the case of the sGnRHa group, the deformity rate ranged from 6.7 to 16.7% in five out of six replications, while in the outlier fish, it was 46.7%. Proximate composition differed significantly between the groups in terms of total lipid content only, being significantly higher in the hCG group (Table 3). In the FA profiles, there were three statistically significant differences between the two groups. Linoleic acid (LA) 18:2n − 6 and total n − 6 content was significantly lower in the sGnRHa group, while the n − 3/n − 6 ratio was significantly lower in the hCG group (Table 4). Reproductive success among the same cohort of percid fish was often reported to be rather variable between the individuals, as reviewed by Żarski et al. (2015). Therefore, the main task for artificial reproduction in pikeperch is to improve the protocol to reduce intragroup variability. Although in evaluating various potential parameters on both the embryonic and larval levels, this study did not find any statistically significant difference between the two different spawning agents, mainly due to high variation within the hCG group. Therefore, parameters of intragroup variability, such as the coefficient of variation, can display useful information on the solidity of the procedure outcome. With that respect, the main parameter of embryonic development, embryo survival, displayed ten- and fivefold higher stability in both commercial (Zug jars) and experimental (Petri dishes) circumstances. Considering that the quality of an egg is defined as its competence to develop into proper embryo (Bobe and Labbé 2010), it can be suggested that the quality of eggs collected after FOM induction by GnRHs was considerably improved in terms of stability compared to the eggs from females treated with exogenous GtHs. In order to find a possible background for this outcome, the difference in the mode of action between these hormones should be considered. As stated above, GnRHs affect the mid of the HPG axis, thus triggering the pituitary secretion. Consequently, the pituitary secretes both FSH and LH (Habibi and Andreu-Vieyra 2007). In fish generally, FSH is considered as the dominant GtH secreted during the vitellogenesis, while LH is prevalent during the maturation phase of oogenesis (Rosenfeld et al. 2007). However, studies conducted on pikeperch showed that both of these hormones are present throughout the vitellogenesis and maturation, suggesting a rather complex endocrine pathway in this species (Hermelink et al. 2011, 2017). The action of GnRHs is not restricted to the pituitary, since they also regulate follicular development on the gonadal level (Habibi and Andreu-Vieyra 2007). In the case of pre-season reproduction, it can be assumed that although certainly present, the level of internal LH is not sufficient to induce FOM itself. Therefore, by injection of hCG which mimics the action of LH (Ezcurra and Humaidan 2014), the ovarian follicle may directly be stimulated to undergo FOM and consequently ovulate (Nagahama and Yamashita 2008). Thereby, using the external source of LH, most of the HPG axis is bypassed. This might explain the variable outcome of hormonal stimulation with hCG during pre-seasonal propagation in cultured pikeperch. A recently published comprehensive study on cultured pikeperch found that the hormonal agent does not modify the outcome of out-of-season reproduction, which takes place after spawning induction in fully controlled conditions of RAS (Żarski et al. 2019). The mentioned study was composed of three consecutive reproduction trials on the same batch of females, and the variability of the outcome was reduced with each trial. The trial which mostly resembles the present study was the first reproduction. In this trial, Żarski et al. (2019) observed threefold lower CV in embryo survival and hatching rate in fish treated with sGnRHa considering the best performing doses using sGnRHs and hCG. Similar stabilisation of the spawning outcome in older age classes of cultured pikeperch was indeed described (Zakęś et al. 2013). Therefore, it might be implied that differences between the agents are most pronounced in younger and less experienced breeders. Therefore, the sGnRHa can be suggested as a more appropriate agent in such fish. Beside the embryo survival rate, there is a parameter that exhibited a considerable difference in intragroup variability—latency time—though in the opposite direction. It is well documented that spawning time in pikeperch is rather variable between the breeders of the same cohort, in both cases of artificial (Żarski et al. 2013) and natural (Lappalainen et al. 2003) reproduction. Narrowing this gap in ovulation times between females, namely through spawn synchronisation, is, commercially, a very important task as it reduces the labour and the fish handling time, which is important for the ethical side of animal welfare. The application of GnRHs in this study might be described as less effective in terms of spawn synchronisation. Therefore, future studies should target different forms and/or modes of application of GnRH analogues in order to alleviate the timeframe between the first and last ovulation inside the group. During oocyte development, most of the lipid incorporation into cells occurs during the vitellogenesis phase (Le Menn et al. 2007; Lubzens et al. 2010). Nevertheless, during maturation, specific physiological process in oocyte takes place, such as cytoplasmic maturation, where most of the yolk proteins are degraded into lipoproteins and free amino acids (Reading and Sullivan 2011). The present study found that the lipid content of eggs could be modified by the application of different hormonal agents in the pre-seasonal pikeperch reproduction. This is in agreement with two similar studies on Eurasian perch. Żarski et al. (2012b) found that fat content of oocyte changes during the FOM, with an increasing trend until mid FOM (stage III) and a decrease by the time of ovulation. Similarly, in a latter study, fat content of eggs showed a decreasing trend from pre-seasonally to seasonally obtained eggs (Żarski et al. 2017). It appears that a decrease in fat content is a natural physiological process during the FOM in Eurasian perch. In the present study, the fat content in ovulated eggs was significantly higher in the hCG group, where the eggs of two females were unable to develop into the larvae. This outcome points into a similar direction in case of pikeperch but asks for more comprehensive studies to verify this relationship between the fat content and egg quality. In terms of FA profile, significant differences were found in total n − 6 polyunsaturated fatty acids (PUFAs), stemming mainly from the LA (p = 0.014). This particular FA differed between the treatments and was the most abundant PUFA within the profile in both groups, which is in agreement with our earlier study on cultured pikeperch breeders. In wild pikeperch eggs from the same area, the most prevalent PUFA was DHA (Ljubobratović et al. 2017b). The role of LA in freshwater fish is well documented since many species are proven able to elongate this FA into arachidonic acid (AA) (Tocher 2003; Turchini et al. 2006), a rather important highly unsaturated fatty acid (HUFA) for fish reproduction (Bruce et al. 1999; Furuita et al. 2003; Mazorra et al. 2003). To our knowledge, the only available study on this issue dedicated to percids found that Eurasian perch had rather limited capacity for the elongation of LA to AA (Henrotte et al. 2011). Differences in n − 6 PUFAs led to higher n − 3/n − 6 in the sGnRHa group. Although the differences were statistically significant, the only study in percids which evaluated this ratio inconclusively found both ratios of 0.77 and 2.34 as acceptable in terms of egg quality (Henrotte et al. 2008). Finally, it seems that unlike the total fat content of eggs, FA profiles were not essentially modified by the applied hormones and no differences in the larviculture performance could be detected. Larviculture success did not differ significantly between the two treatments. It seems that although different hormonal inductions affected the egg quality, the effect was not visible on the larval level. Larval performance, in general, could be explained as satisfactory since the main parameters, survival and growth, fit inside the range of previously published results (Szkudlarek and Zakęś 2007; Lund et al. 2012; Ljubobratović et al. 2015). Therefore, we may describe the larvae obtained from cultured breeders in the IPCS propagated 2 months prior to the natural spawning season as proper stocking material for juvenile production in intensive systems. To conclude, sGnRHa rather than hCG can be suggested as an appropriate hormonal agent for pre-season spawning induction in outside cultured pikeperch, as it reduces the variability in reproductive performance between the breeders of the same cohort. Different hormones can modulate fat content in the eggs. While the type of hormonal preparation affects the outcome on embryonic level, it seems that the quality of developed larvae is not altered. Finally, rearing pikeperch breeders in the IPCS offers a 2-month- to 3-month-long pre-season supply of stocking material suitable for juvenile production in the RAS. Open access funding provided by National Agricultural Research and Innovation Centre (NAIK). This work was supported by the European Regional and Development Fund and the Government of Hungary within the project GINOP-2.3.2-15-2016-00025.